Dr. Galbo has trained extensively in orthodontics and has over 25 years of experience in helping people align their smiles. Your teeth will look brilliant, and you’ll love to show them off after completing one of our orthodontic treatment solutions. Certified in 2001 to complete Invisalign treatment, Dr. Galbo provides these clear aligners that make it easy to straighten your smile. 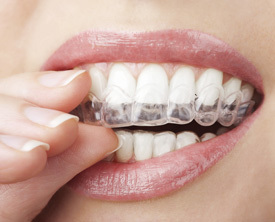 Each set of aligners is worn for two weeks at a time, then changed out for a new pair. You wear them for 22 hours a day and can take them out at your convenience. These nearly invisible aligners are removable and made in the USA. They’re another inconspicuous orthodontic alternative that can give you the results you want. Still an effective option, conventional wire braces can be used by all ages who seek to align their teeth. Get the smile of your dreams. Book your appointment today! We are in-network with Guardian® and Aetna® insurance plans.